On August 28, Tropical Storm Irene made landfall in the eastern US. While damage was widespread in multiple states from South Carolina to Maine, Vermont was hit particularly hard by the storm. Irene’s intense rainfall caused local rivers to overflow and flood several towns in central Vermont. Highways were washed away, downtowns were flooded, and people’s homes and livelihoods were carried away with the rising waters. The area surrounding Bridgewater Corners, Vt., was severely impacted by flooding during Irene. While the Long Trail Brewery & Visitor Center was in the middle of it all, it managed to escape any serious flooding or damage. Unfortunately, many others in the region weren’t so lucky. After the storm passed, local residents found many important roads had been completely washed away, leaving them cut off from access to food, electricity and other necessities. People were in need, and Long Trail stepped up to lend local towns a hand. Notifications were sent out for people to head to their Visitor Center for food, water, electricity (to charge their phones and other devices), and supplies like diapers and baby formula. In the days following the storm, their restaurant was preparing upwards of 300 meals per day—breakfast, lunch and dinner—for those in need. The Red Cross also used the brewery grounds as a relay point to drop off supplies that were then lifted via chopper to the towns of Rochester, Killington and Plymouth, which had become inaccessible by the washed-out roadways. 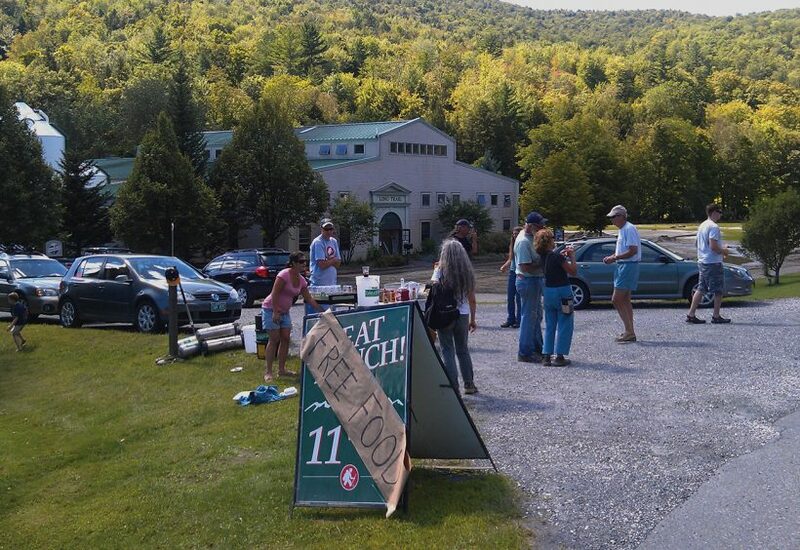 Long Trail might have been spared, but other small businesses in Vermont weren’t as lucky. 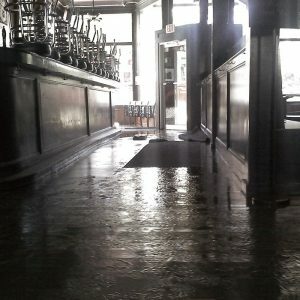 The Flat Street Brew Pub in Brattleboro was completely flooded, and The Alchemist Pub, situated on Main Street in Waterbury, also fell victim to the floodwaters. Despite the extensive property damage, things could have been worse. Kimmich had flood insurance, and is hoping to finish rebuilding in four to six months, adding increased energy efficiency and seating capacity. Their off-site cannery was spared from the flood, and has been selling out of the 30 barrels of beer per week it produces. 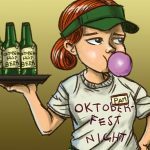 Can Extra Bubbles Give Foster’s a Lift? 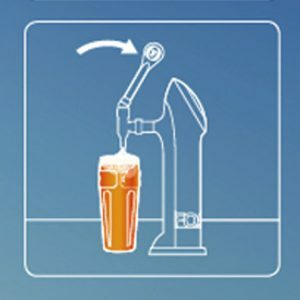 Heineken UK, in an attempt to perk up sales of Foster’s draft lager in pubs, is introducing a new proprietary tap dubbed “The Pourtal.” This bubble-boosting tap claims to create “the perfect head” by improving on the brand’s previous custom-made “Head Injection Tap” technology. The new tap, which took over two years to develop, encourages bartenders to pour to get as little head as possible. 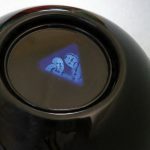 Then at the push of a button, the head is blasted into the pint by driving beer through a smaller second nozzle, which creates a layer of tiny bubbles that Heineken UK claims will “lock in the taste.” Tests have also shown the beer retains its fizziness substantially longer. Heineken UK hopes to roll out the apparatus to 7,000 pubs in the first six months, eventually increasing the number of locations to 30,000 within two years. It’s been a long time coming, but America’s oldest brewery is finally introducing itself to the state of Ohio. Thanks to recent renovations to the Mill Creek, Pa., brewery, Yuengling has the production capabilities needed to fully support the thirst of an additional state. The beer will be rolled out in two phases. The northeastern region (which includes Cleveland and Columbus) will receive their first shipments in early October. The rest of the state (including Toledo and Cincinnati) will have to wait one more month to invite Lord Chesterfield home for a nightcap. Ohio is the only state bordering Pennsylvania that does not sell Yuengling brews, and the move will increase Yuengling’s distribution footprint to 14 states. The rapscallions over at Scotland’s BrewDog have unleashed another record-setting ale, both in terms of alcoholic strength and dispensary ingenuity. BrewDog claims that the beer, named “Ghost Deer,” is the world’s strongest fermented beer—a barrel-aged Blonde Ale weighing in at a hefty 28 percent ABV. This ranks just above the previous record of 27 percent, which was held by the Samuel Adams’ Utopia series. Other beers with comparably high ABVs—whether from BrewDog or other breweries—were all created using various freeze-distillation techniques, and were not the result of exclusively fermenting. Previous: "Our Sources Say ..."